It was still talking to cura over the network and i was able to upload a print job but i jsut got the message that it failed for unknown reasons after a few minuted (which i guess was it doing bed height calibration). Also the network connectivity has now become dodgy - apps not connecting etc. Its like there is a big cascade failure. Also i did all standard turning it off and on again type troubleshooting. HI, thanks for the reply, i had some more time to investigate and it looks like the device arrived damaged (possibly during transport). i eventually found that giving the screen a gentle push would make it come back which indicated a loose connection. 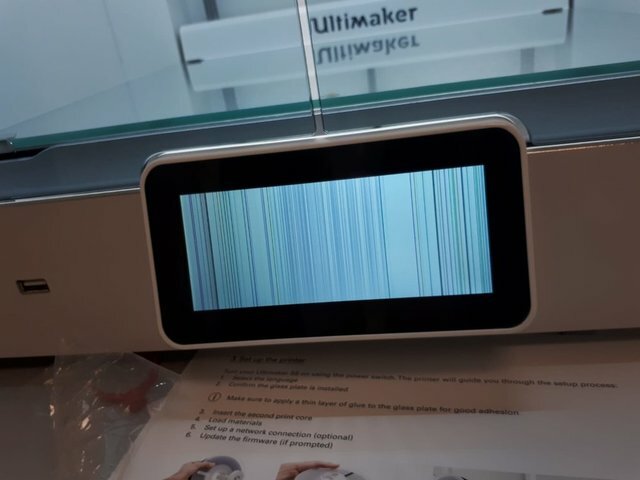 this stopped working pretty quickly, so given the screen is at the bottom i had a careful look underneath the device and there were some significant cracks in the plastic board on the bottom which is what i guess led to the system not working properly. I have decided not to pry any further and will send it back on Monday morning. Sounds like it got dropped during shipment. thanks for the replies and advice everyone, appreciate the time you took. i spoke with the vendor this morning and they are going to replace it.